Anniston Army Depot (ANAD) in Alabama is located “in the foothills” of the Appalachian Mountains in the northeastern part of the state. It’s a U.S. Army maintenance center and munitions storage site with over 15,000 acres of woodland; more than three million square feet of maintenance and production buildings and well over six million feet of storage. The footprint of the depot may be small compared to some military installations but the work done at ANAD has world-wide implications for support, logistics, and readiness. Find information about Anniston Army Depot, Alabama including the main commercial and DSN numbers for the base, information on basic services, base transportation, lodging for TDY and PSCing personnel, and inprocessing. ANAD is the home of the Center of Industrial and Technical Excellence (CITE) “for tracked and wheeled ground combat vehicles” plus artillery, assault bridging systems, trains and rail equipment, and much more. The depot also distributes, maintains, and stores conventional ammunition and missiles worldwide. In 1940, the War Department began planning the construction of the Anniston Ordnance Depot. IN 1941, ground is broken to build more than 500 buildings including warehouses, munitions storage, admin, etc. It wouldn’t be until the 1950s when the ANAD maintenance mission began at the depot. 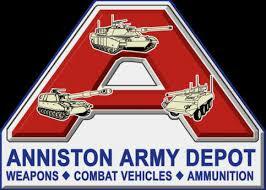 In 1962, the facility is redesignated as Anniston Army Depot; it was also re-assigned under the jurisdiction of the Army Materiel Command. Not long after, the facility began storing and maintaining chemical munitions. The 1970s were a crucial time for ANAD; it began its’ work on the M1 Abrams ANAD and created the “Physical Teardown/Maintenance Evaluation”. It would acquire more responsibility thanks to the addition of missile maintenance duties soon after. In the 1980s, ANAD began work to dismantle its’ stockpiles of chemical weapons. 1983 saw the depot supporting Operation Iraqi Freedom with its’ manufacture of “Armor Survivability Kits”. Later, Anniston Army Depot would also support the Stryker fighting vehicle mission with repair and maintenance of battle-damaged Strykers. ANAD celebrated its’ 75th anniversary in 2016; its’ mission today includes maintenance on the Army’s heavy-tracked combat vehicles including the M1 Abrams, M60 Patton Tank, and THe M88 Recovery Vehicle. It is also home to the Small Arms Overhaul facility. Anniston Army Depot is located in Calhoun County, which boasts a unique combination of outdoors attractions, U.S. history, performing arts, and natural wonders/ You can visit the Anniston Museum of Natural History in Lagarde Park, tour the Berman Museum of World History in Anniston or go off-roading at Choccolocco Mountain Off-Road Vehicle Park. You can also learn how Calhoun County factored into the Civil Rights movement by touring the Freedom Riders Civil Rights Heritage Trail. The Mountain Longleaf National Wildlife Refuge in the southern Appalachian mountain range in Anniston with approximately 9,000-acres of mountain refuge. For those looking for live performances, the Oxford Performing Arts Center and the Anniston Performing Arts Center are must-see destinations in the area. The Talladega Superspeedway is hosts to both NASCAR series and area driving schools; this is also the location of the International Motorsports Hall of Fame. All new arrivals are directed to request an Army Community Service Welcome Packet by calling 256-235-7445 or DSN 571-7445. In-processing is done at the Anniston Civilian Personnel Office during regular duty hours. On-post health care options are not available except for occupational-related issues. All healthcare needs must be handled off-post and new arrivals should call TRICARE to discuss changing networks, local healthcare provider options, etc. There is only general information available from official sources about Anniston Army Depot child care options, waiting lists, and registration requirements. Those due to PCS to the depot should contact the base Morale, Welfare, and Recreation office at (256) 235-7654 to learn more about options on post or in the local area. All inbound personnel are directed to track and manage their household goods shipments at the Defense Personal Property System at Move.mil. All personnel are directed to use the RAPIDS scheduler for appointments related to dependent or retiree ID card renewal, replacement, or new issue. The Anniston Army Depot ID Card Office may accept walk-ins on a limited basis depending on demand, mission requirements, and other considerations. Two forms of valid ID are required and expired ID cards cannot be used as a secondary form of identification. Call (256) 235-7633 for more information. No on-post temporary housing is available at the depot; all temporary lodging is provided by commercial hotels, Air B-n-Bs, etc. There is no on-post transportation; all transport to the depot from local airports is via commercial providers. Vehicle Registration at Anniston Army Depot is required-new arrivals can register a maximum of three with proof of insurance and compliance with state vehicle regulations. Those TDY to the depot can request vehicle passes for up to 30 days. Those TDY longer than 30 days will need to contact the Anniston Army Depot Badge and Vehicle Section for further instructions. All vehicles entering and leaving the depot are subject to search, 100% ID checks, etc. Motorcycle riders are required to be fully compliant with state laws when riding on post.